Learning about the tragic death of South African rally driver, Gugu Zulu, on Mt Kilimanjaro this week brought back some vivid memories of this majestic yet unpredictable mountain in Tanzania. My first glimpse of Kili was in 2007 when we were on an overland trip to Khartoum, Sudan. Arriving in Moshi well after dark and pitching our tent at Honey Badger camp, where we had some interesting experiences, I had no idea what was waiting for me in the morning when I wake up. 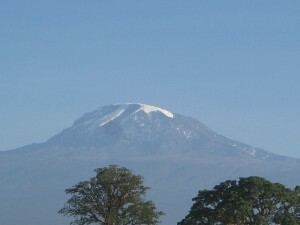 When unzipping the tent the totally unexpected view of Kilimanjaro took me totally by surprise! 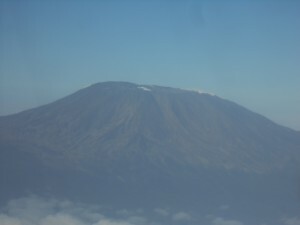 Being born and bred in Africa I have always dreamt about seeing Kili. All my life I had this picture of the mountain in my head and imagined what it would be like to see it for the first time, but never ever did I expect this. And there it was with its ice cap clearly visible on a cloudless morning! According to the local people we were fortunate enough to have our timing right as most of the times the top of Kili is covered with clouds. I think it was sort of a pre-order just for me! My next encounter with Kili was seven years later during a Precision Air flight to Zanzibar – this time seeing a totally different view. 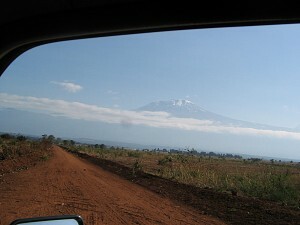 and definitely not how I remembered Kilimanjaro from my first sight! Although I was feeling queasy during the flight, due to a bumpy ride caused by bad weather, I could still appreciated the view. Sadly, this time the snow cap was visibly and alarmingly smaller than seven years ago. You always hear about global warming on the news and think that we will not experience it in our lifetime, but this time round I have seen it with my own eyes. Seeing the dramatic effect of global warming on Kilimanjaro is part of my determination to recycle and contribute to saving the planet for the next generations to come. From now on I will do my part towards recycling!